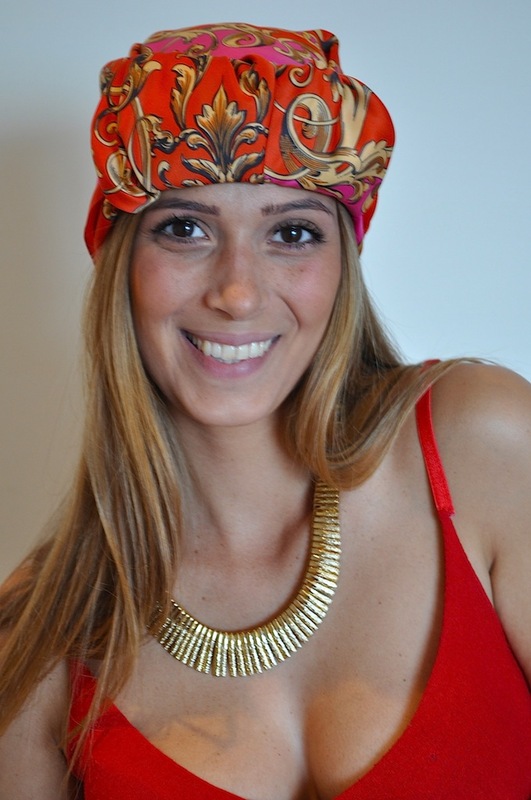 Tutorial: how to wear a turban | Cosa Mi Metto??? Hi girls, how is it going? I noticed with extreme pleasure that you enjoyed a lot my last post and this is why I decided to share today a tutorial post. You can find the whole procedure on the video and theessential steps showed on the photos. Ciao ragazze, come va? Ho notato con estremo piacere che vi è piaciuto molto il mio ultimo post ed ecco perchè oggi ho deciso di condividere con voi un tutorial. Potete trovare l'intero procedimento nel video e i passaggi essenziali nelle fotografie. 1. Fold the scarf like a triangle. 1. 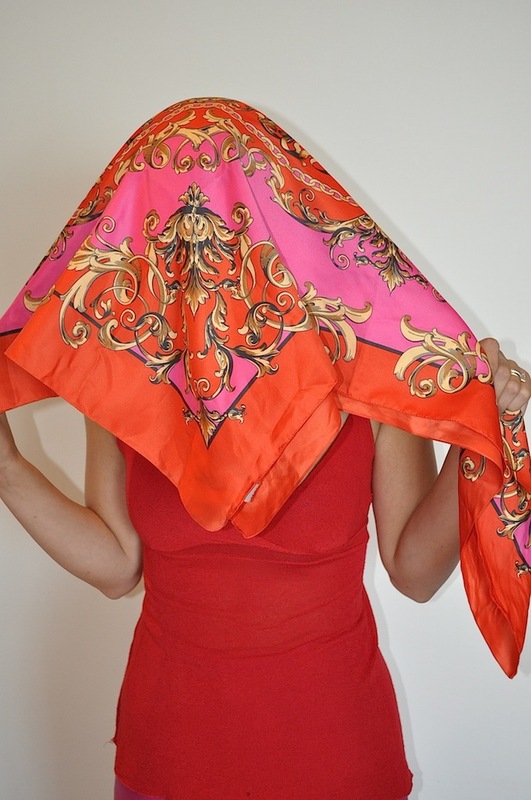 Piegate il foulard a triangolo. 2. Place it on your head so that the tip will cover your face. 2. Appoggiatelo sulla testa in modo che la punta vi copra il viso. 3. Cross the lateral tips on your forehead. 3. Incrociate i lembi sulla vostra fronte. 4. Bring the lateral tips on your neck and tie a knot. 4. Portate i lembi sul collo e annodateli. 5. Fold the tip of the scarf where you had previously crossed the lateral tips. 5. Ripiegare la punta del foulard dove avevate incrociato precedentemente i lembi laterali. 6. Arranged the scarf to your liking and if you want you can decorate it with a brooch. 6. Sistemate il foulard a vostro piacimento e se volete potete decorarlo con una spilla. Thanks for this post - so helpful! You look amazing in a turban as well! lovely! thank you for sharing.. Fantastic! Thank to you!) Happy day to you, beautiful! you look stunning - love the colors so pretty !! wauw you look great ! Che bello questo tutorial! Bravissima!! 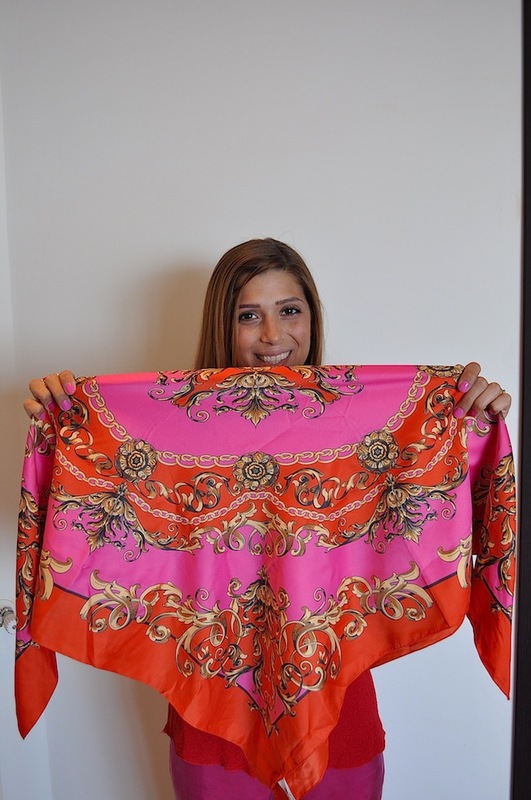 Thanks for sharing how you did the turban! I'll gonna try it out! ma che bello questo post! !1 Adesso ci provo subito! ahaha Un bacio!!! wow! it is so simple! Thank you for the tutorial! che carina!!!!!!!!!! complimenti per il post e la bella idea!!!!!! suits you! thanks for stopping by my blog! Cute! I never knew how to do this til now! Buen tutorial, aunque a mi no me convencen los turbantes. Estas bellisima!!!! muy bien el turorial, pero creo que no me sientan nada bien. Grazie mille cara per quest'idea. Non sapevo come farlo. It's my birthday week and I'm giving 2 lucky readers sunnies of their choice! Go to http://www.joeiandme.com/2012/05/my-birthday-giveaway-win-pair-of.html if you want to join :) Open to international readers! and you tutorial was great ! Great tutorial, I might try this myself! Did you have a wonderful weekend? Hope so! Stopped by to say it was lovely to have you visit me on the blog last week. I'd love to follow you on Twitter ... just follow me at @oohalfroufrou ~ I'll look for it and follow you back! Have a wonderful new week! Nice post, like it! but i don´t know if i will wear it !! The tutorial video is great!! you are perfect as always!! You are so pretty!!!!! Love this, I have been wanting to wear a turban but didn't know how to do it, this is a great tutorial! Such a great tutorial hun! Thanks for being so kind with my first tutorial! Grazie per essere state così gentili con il mio primo tutorial! ci ho appena provato ed è venuto benissimo!!!! I'm lovin the turbans!I'll be rocking them on my next beach vacay! But I don't know if I have the guts to wear one! bravissima!!! mi ispiri allegria!!!! inizio a seguirti! Thanks for posting this! I´m definitely going to try it out!! This just looks really amazing! You wear it so well, I could never pull that off!